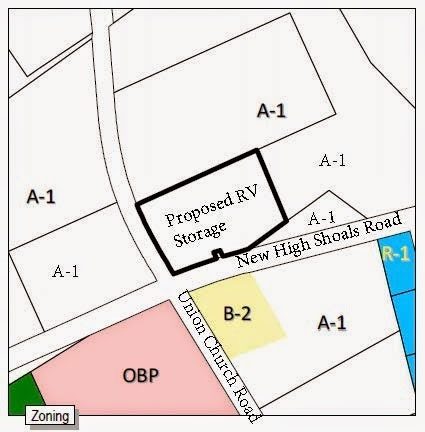 The developer of a proposed recreational vehicle storage facility at the corner of New High Shoals Road and Union Church Road today asked to withdraw the application for the rezone needed for the facility. Williams and Associates, representing property owners Herbert E. Michael and Mark Selvidge and Ted Evans Jr., of Watkinsville Storage, gave no reason in the short letter filed with the Oconee County Planning Department for the request to withdraw the rezone from the Jan. 6 agenda of the Oconee County Board of Commissioners. The request follows a unanimous vote of the Planning Commission on Monday night against the rezone request. That vote came after critical comments by a room full of citizens in attendance at the meeting. The Board of Commissioners will have to vote formally at its January meeting to withdraw the rezone request since the item already has been acted upon by the Planning Commission, according to B.R. White, director of the Oconee County Planning Department. Property owners Michael and Selvidge were asking the county to rezone just less than five acres on the northeast corner of New High Shoals Road and Union Church Road from Agriculture (A-1) use to Office-Institutional-Professional (O-I-P) use. The purpose of the rezone was to allow Watkinsville Storage, 67 Greensboro Highway (SR 15) in the industrial park in Watkinsville, to build what was being called Watkinsville RV Storage. Jon Williams of Williams and Associates, 2470 Daniells Bridge Road, told the Planning Commission on Monday night that Evans of Watkinsville Storage planned to construct a secure automobile commercial parking lot and garages for recreational vehicles and boats at the site. Those who spoke against the rezone on Monday night said the project would be unsafe, would create traffic problems and light pollution, and would decrease the value of their properties. While the withdrawal of the rezone probably means that this particular project is dead, the property owners can come back in the future with another commercial use for the property. While most of the land nearby is residential, two other parcels in the intersection have been zoned for nonresidential use. In 1985, two acres were carved from a larger 10-acre tract in the southeast corner of the intersection and zoned for Business (B-2, Highway Business District). A grading company operation is housed on that land today. In 2003, the Board of Commissioners rezoned 12 acres in the southwest corner of the intersection from A-1 to Office Business Park (OBP). The land is undeveloped today and is owned by the Georgia Association of Conservation District Supervisors, a nonprofit organization. According to the narrative from the 2003 rezone, the intent is to construct a two-building office and conference center on the site. The county planning staff said in its report prior to that rezone that “a commercial development does not fit” with the county’s future land use plan and recommended against the rezone. The Planning Commission accepted that recommendation and asked the Board of Commissioners to deny the rezone request. The Board of Commissioners on July 1, 2003, ignored both the staff and Planning Commission recommendations and voted unanimously to approve the rezone. The planning staff recommended the rezone request for the RV storage facility based on the 1985 and the 2003 rezones by the Board of Commissioners. In the current land use plan, the area surrounding the Michael and Selvidge property is designated as Suburban Living. “Based upon the proposed development plan, this request does not comply with the development strategies, goals and objectives for the Suburban Living character area,” the staff report states.